Shrewsbury Town manager Mike Jackson wants to remain in charge at the Greenhous Meadow following relegation to League Two and expects his situation to be resolved by the end of the week. After initially succeeding Graham Turner in a caretaker role, he was then installed until the end of the season. "Shrewsbury's season began to fall apart before they had even put a team together, thanks to last summer's repeated failures in the transfer market. "Attempts to patch holes with a succession of loan signings who were not good enough, or did not stick around for long enough, and a lack of permanent additions again in January sealed Turner's fate as results took a drastic turn for the worse, particularly at home. "The club went for continuity in coach Mike Jackson but results on the field failed to improve. "A chronic lack of goals, despite the deployment of 14 different strikers over the season, undermined the efforts of a decent defence. "With only a handful of players under contract, and a manager without a deal beyond May, Town face a massive rebuilding job over the summer. "A core of good young players provides hope but, after 15 years trying to get back to the third tier, the reality of the club's experience there must be swept away by positive close season action." But Shrewsbury won just three times in 19 games following Turner's departure. "I'd like the opportunity. I've learnt a lot in a difficult situation," Jackson, 40, told BBC Radio Shropshire. "But I'll be better for that moving forward. It's a great big learning curve. "Everyone know what's gone on, and there's other things that have gone on. "It's easy to take over a team who are doing well, but you don't get taught any of this on a management or coaching course. You've got to learn and learn quickly." 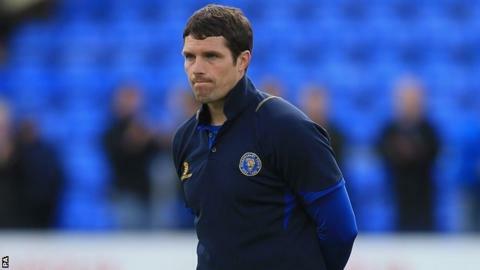 Shrewsbury finished eight points from safety and Jackson is aware that their relegation was due to their lack of goals. Although they had the tightest defence among the bottom eight clubs, Shrewsbury (44) and Carlisle United (43) were the only two teams to average less than a goal per game in League One. "Ultimately, we haven't scored enough goals to keep us in the division," he said. But, having begun as caretaker boss on 21 January and then handed command until the end of the season exactly a month later, Jackson now wants to take the job on a more permanent basis. As was the case when Turner stepped down in January, a host of names have once again been linked with the Town job, although one reported contender Steve Burr has already been removed from the frame after being persuaded to stop on at Chester. Jackson continued: "Now the season's over, things will settle down and it all needs to be discussed in terms of moving forward. "I'd like to be able to put my own team together and be able to keep some of those players here, which might be hard with some of them, but it should all be sorted in the next week to 10 days."